Mikey and Ryan are getting Elves, sent all the way from the North Pole, to watch over them during the Christmas Holiday Season. They will report back to Santa every night, to let them know if the boys have been naughty or nice. I am proud to announce our adopted elves names are...Max and Buddy. Max and Buddy looking over the "Nice List." Mikey and Ryan are at the top of the list! 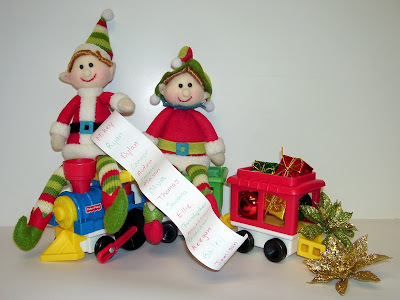 The Elves have boarded the train and will travel the next seven days, all the way from the North Pole, to arrive on November 27th, the day after Thanksgiving. What does this all mean? Stay tuned to find out! Mischief and elf mayhem will abound, all in good fun for the boys to find every morning! Where did you get those? I have been wanting to get one for Chloe (and now Caelyn) but I haven't found ones I like (or that were not plastic).